The Greenhouse BMP Manual was reviewed by a Grower Advisory Board consisting of Jodie Gilson, J. Gilson Greenhouses Inc.; Jason Hutchins, The Flower Hutch; David Giurleo, Colonial Gardens; Fred Hulme, The Scotts Company and by Brad Mitchell, Massachusetts Farm Bureau Federation and Michael Botelho, Massachusetts Department of Agricultural Resources. Mention of trade names and products is for information purposes only and constitutes neither an endorsement of, recommendation of, nor discrimination against similar products not mentioned. Although this guide contains research-based information and the contributors have used their best efforts in preparing this guide, the contributors make no warranties, express or implied, with respect to the use of this guide. Users of this guide maintain complete responsibility for the accuracy and appropriate application of this guide for their intended purpose(s). In no event shall the contributors be held responsible or liable for any indirect, direct, incidental, or consequential damages or loss of profits or any other commercial damage whatsoever resulting from or related to the use or misuse of this guide. The contributors emphasize the importance of consulting experienced and qualified consultants, advisors, and other business professionals to ensure the best results for producing nursery stock. A set of production guidelines known as Best Management Practices (BMPs) for the purposes of this manual are voluntary activities undertaken to minimize negative effects on the environment. The manual is not intended for regulations. 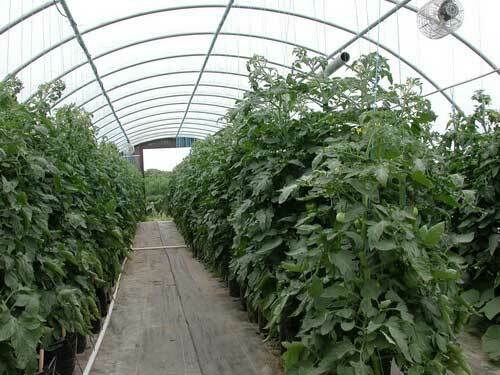 BMP considerations for greenhouse production include site selection, water management and irrigation, nutrient management, composting, prohibited plants, pesticide use and storage, insect, mite, disease and weed management, animal damage management, organic and inorganic waste management, and alternative energy and energy conservation. BMPs are adaptable for the diversity that exists within the industry. Applying these practices will help Massachusetts greenhouses and nurseries to remain (or become) healthy and profitable. A greenhouse is a structure with a glass or plastic roof and side walls that is used for the production of ornamentals and food crops and may be used seasonally or year round. The closed environment of a greenhouse has its own unique requirements, compared with outdoor production. Pests and diseases, and extremes of heat and humidity, have to be controlled, and irrigation is necessary to provide water. Significant inputs of heat and light may be required, particularly with winter production of warm-weather crops. Greenhouses for commercial production can be classified as free-standing or gutter-connected. A free-standing greenhouse can have a quonset (hoop), gothic or gable roof shape. The quonset is usually the least expensive and is available in widths up to 36'. Gothic designs have higher light transmission and shed snow easier. Gable designs may use trusses to span a width up to 60'. A gutter-connected greenhouse is a series of trusses connected together at the gutter level. Individual bays vary in width from 12' to 25' and have a clearance of 8' to 16' to the gutter. Bays can be put together to get any width of greenhouse desired. Greenhouses can be made any length. Standard lengths that utilize glazing materials to advantage are 96' and 144'. All greenhouses are modular with frame spacing of 4' or 5' for hoophouses and 10' or 12' for gutter-connected designs. Most greenhouses are built of galvanized steel tubing and are available from many manufacturers throughout the U.S. Steel makes a strong frame to carry snow and wind loads and still allow about 80% of the light to enter. Most greenhouses are covered with a plastic glazing. Low-cost polyethylene film or covering applied as an air inflated double cover will last 4 years. Anti-drip agents and infra-red inhibitors are added to give better service and reduced heat loss. Semi-rigid structured sheets of polycarbonate or acrylic are more permanent and have a life of at least 15 years. Tempered glass is used for crops requiring high light levels. Easier to provide separate environments as each house is controlled by its own heating/cooling system. One house can be run warm for propagation and the next one, cooler for growing. Individual houses can be shut down for periods when not in use saving energy. Best suited for heavy snow areas as multi-span houses need heat to melt snow from the gutters. Individual houses are easier to build and maintain. More cost effective for areas greater than 20,000 sq ft. Reduced heating costs as surface area to floor area ratio is less. Heating costs can be as much as 25% less due to reduced glazed area. Less land is needed. About 30% more growing space can be placed on the same amount of land area. Open-roof designs that eliminate fans and reduce electricity use are available. 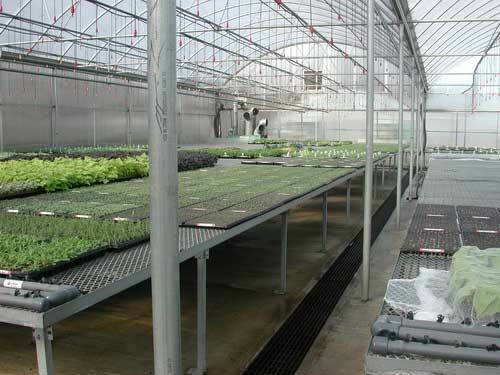 In addition to the greenhouse style, there are a variety of production systems used inside the greenhouse. Some crops are grown in containers on benches, such as many spring ornamental crops, while others are grown in the soil in the ground such as cut flowers or vegetable crops (ie. tomatoes, lettuce). Some crops are grown in containers or bags of growing media that are placed on the ground (tomatoes). Some greenhouses have soil or gravel floors, some have concrete floors and some have a combination. All of these differences contribute to best management practices that will vary according to the greenhouse and systems used for production.